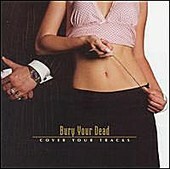 Bury Your Dead may have dressed like dapper gentlemen for the pictures for Cover Your Tracks, yet the outfit's sonic metal buzz falls nothing short of blistering. On the 12-track release (from which each song is curiously named for a Tom Cruise film), the guttural vocals and piledriving dropped down guitar riffs found on tracks like "Magnolia" and "Risky Business" are bountiful, sounding like a dressed down version of Slipknot and Fear Factory with hints of Earth Crisis-esque metalcore mixed in. While Bury Your Dead's straight path to devastation comes without much variation, there's no doubt that at the album's fiercest moments, Cover Your Tracks is the perfect soundtrack to destroy everything around you to.